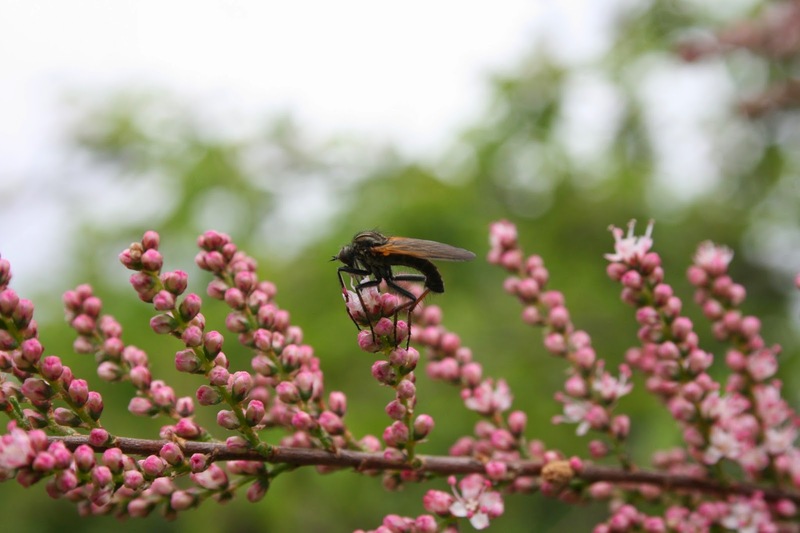 Wandering around the garden this morning I brushed past a Tamarisk branch sending a flurry of winged insects into the air. 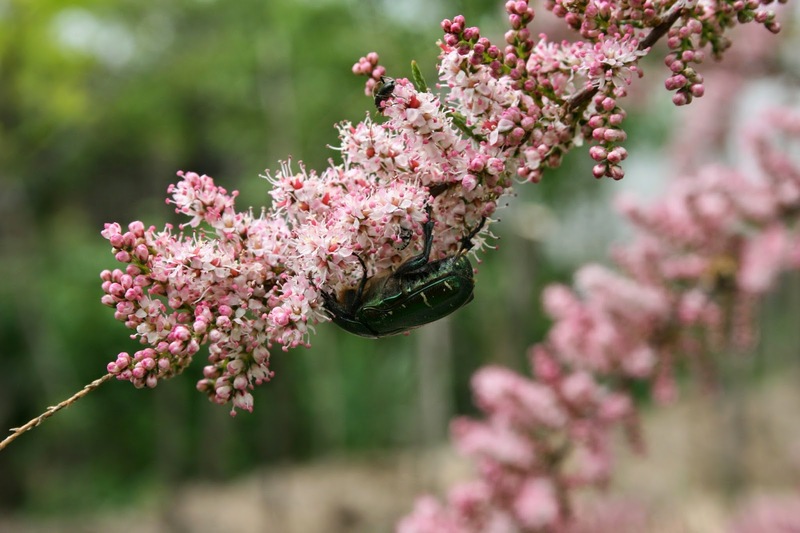 The plant is always stunning at this time of year, each branch adorning candy floss pink flowers, but until today I hadn't realised the enormous diversity of insects that the plant attracts. A brief count up revealed at least eight different species, some nectar feeding, others hunting the nectar feeders, all seemingly as mesmerized as I was in this spectacular plant. 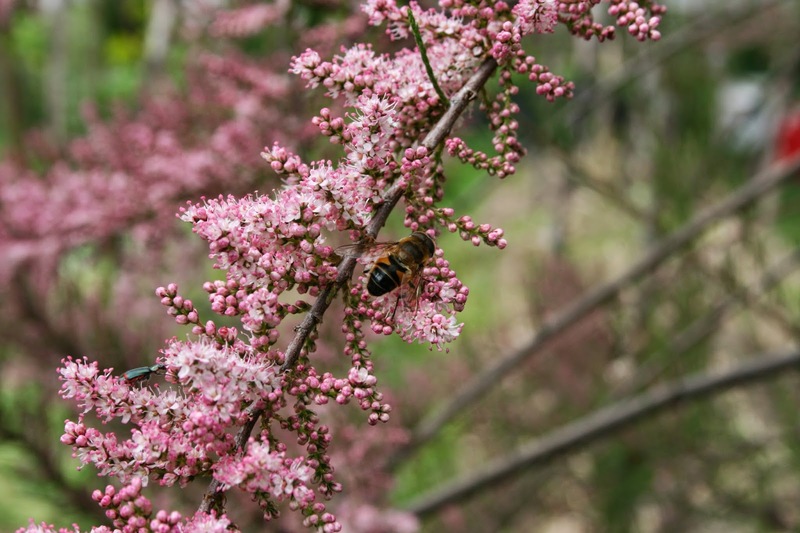 As well as being a good biodiversity plant, Tamarisk branches can be used for basketry, the nectar is forage for honey bees and the plant is relatively unique it that it can tolerate saline soils and actually concentrates salt within the plant. This makes Tamarisk a good choice for planting around gray water outlets. Overtime, gray water systems often accumulate salts in the surrounding soil and this can be damaging to nearby plants. This is due to the fact that water in the soil spaces is taken into the root hairs of a plant by the process of osmosis (see below), there being a higher water concentration outside than within the root hair cells. If the water concentration outside the plant becomes less than inside the plant (i.e the salts have dissolved in the water) the higher concentrated water from within the plant will move into the soil and the plant will desiccate and die. By planting a few Tamarisk shrubs on the fringes of your gray water outlet, you may help reduce the accumulation of salt in the soil. Quite a circus act. Suspending mating whilst the mate is feeding! definition of osmosis - the movement of water from a region where there is a high concentration of water to a region where water concentration is lower, through a selectively permeable membrane.